We only had contact through email but they were always answered timely and all questions/concerns were addressed efficiently and friendly! This was one of the best condos we have ever stayed and, over the years, we have stayed in many condos and some were more than double what we paid for at the Vista A304 and they did not provide all the amenities that this one did. It was beautifully decorated, with all new appliances, countertops, televisions, etc. We have never stayed where there were so many towels left at our disposal -- all new. The kitchen was stocked so well we did not have to buy any spices, oils, etc. ; as well as the dishes and cutlery and baking/cooking pans -- we did not want for anything. One of the most important things to us is the cleanliness of a place and this was immaculate! The description in the website is more than accurate! The only downside to the condo, was, unfortunately, the location. The lanai and lanai furniture were new and all very clean and comfortable, but the noise, because of the condo being close to an intersection, was very loud and extremely distracting while having our meals outside. However, most visitors are not using the lanai as much as we probably did, so that would not be too detrimental. Once inside and the doors were closed, there was no noise at all. All the other benefits the condo offers, especially the cleanliness and everything in excellent working order, should be the primary reason for renting A304! Thank you for everything, especially quick action when we asked maintenance. From our first contact through to check out, the staff were always quick to respond to our questions. Top notch service! 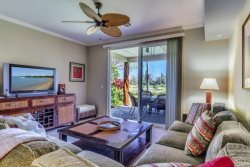 Waikoloa Beach Villas G2 is a great spot to vacation for a week or a month. Well located with excellent services nearby, it was the best vacation rental we have ever stayed at and the one by which all others will be judged. We even had an email from Su after we arrived to check with us. I had already recommended the property even before arrival as it was recommended to us by our neighbors. Fantastic place, roomy and great for two couples or a family. Great location on the island to get to most of the best beaches, and easy to cut across the highway on the way back from long day trips exploring the North and south sides. Top notch everything, lanai with BBQ is great for dinners at home and TV in each room fun for couples retiring separately in the evenings. We worked with the owner of the condo, Rod Garner. He was very easy to work with. He made all the arrangements and forwarded emails to us with instructions, favorite places to see, eat, and relax in the sun. He is great to work with and very generous by sharing it and making it possible. This property is a wonderful place to enjoy. It is a beautiful place! You can be as relaxed or adventurous as you want. There is something for everyone. The adventures are close, ATV riding, zip line exploring, helicopter rides, hiking, snorkeling, lost of water activities, and golf or you can relax by the pool and enjoy the many wonderful beaches. We liked the Beach there at the condo the best. We had a fantastic week. Wonderful! We'll be there again next year! I first would like to thank Tracy. Tracy found me the unit and was very helpful over the phone. This was the first time I ever rented a home. Tracy made me feel comfortable that I made the right decision. Tracy should be commended for her professionalism. I also want to thank Ann Marie. I also spoke to Ann over the phone and email exchanges. She answered all of my questions. Both Tacy and Ann Marie should be commended for a job well done. Employees like them are hard to find. They are a great asset to your company. MANAGEMENT RESPONSE: Mahalo for the kind review. I agree they are an asset to the company! My family and I loved the property, expecially my kids. They still talk about their experience at the property. This propery exceeded our expectations. Our family stayed at the Golf Villas, Unit J3 three weeks ago, and just wanted to let you know how much the six of us thoroughly enjoyed our stay. The tastefully decorated, immaculate premise is great complete with the Apple Mac Large Screen Computer, flat-screen TV, full kitchen, outdoor BBQ in a peaceful gated community. Located just minutes away, we loved having privileges to the Grand Hyatt resort, pools, and attended their first-rate Luau. We also appreciated the use of the bikes, boogie boards, snorkeling gear for our beach excursions. We made a day-trip to Hilo, where we hiked the volcano, lava tubes, and water falls. The access to grocery stores, malls were so convenient. We will certainly recommend this hidden treasure at such an unbelievably affordable rate to our friends and family. Thank you for the well-organized directions and easy access to the condo. I had the most fantastic stay, I only wish it was for longer.